This article looks at the long-term continuity and change of architecture in an island community in north-west Scotland. As 'buildings archaeology' in the broadest sense, it draws on diverse sources to explore particular features of the use of local materials, the adaptation of local designs and the use of space over a 2000-year period. 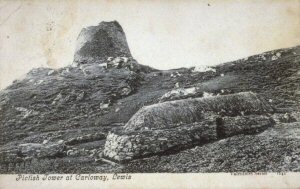 Postcard by J Valentin and Co. of Dun Carloway (c.0 BC) and an adjacent crofthouse (c.1850 AD) in Lewis. Taken c. 1898. The vernacular architecture of the Western Isles has been the focus of archaeological research for the last 150 years. This has been almost exclusively period specific, largely concentrated on buildings of the middle and later Iron Age, and has adopted a biased and explicitly negative view of the vernacular buildings of the post-medieval period. This article presents a model where aspects of use, materials and design are explored from a perspective informed by the study of post-medieval buildings in the same locale. By drawing together evidence from ethnography, photography, folklore studies and archaeology, it facilitates a new understanding, where this tradition of buildings is seen as a dynamic continuum rather than a series of unrelated architectural paradigms.